It’s true that politics in America will never be the same. But neither Donald Trump nor Bernie Sanders are the ones changing the game. Something much deeper is at work. America’s two main political parties have dominated the halls of government for as long as anyone alive can remember. Once complacent, both Republican and Democrat leaders are now in desperation mode, unable to control even their own backyards as maverick contenders Donald Trump and Bernie Sanders threaten to overturn decades of stable political management thanks in large part to the power of social media. Bernie Sanders’ enthusiastic followers have acted as a virtual crowdsourced digital marketing agency, while Donald Trump has taken control as his own publicist-in-chief. Trump and Sanders are bypassing both of their parties’ establishments as well as the country’s mainstream media in order to appeal directly to the public, and the public has responded in a big way. Trump now stands alone as the clear favorite in the Republican Party, having knocked last year’s expected nominee, Jeb Bush, out of the running two months ago. Another 11 candidates have dropped out since, and Trump is the only one left who can win enough delegates for a standard nomination. On the other side of the aisle, Bernie Sanders is capturing the imagination and enthusiasm of young people in a way that few candidates ever have. An elderly Jewish socialist in a country where the demographics are lined up against him and socialism has historically been a dirty word, defeated Hillary Clinton by an extraordinary 84% to 14% among under-30 voters at February’s Iowa Caucus, the first chance for ordinary citizens to vote on their preferred nominee for the upcoming election. The overall vote ended in a tie, but Sanders’ dominance of the younger generation in Iowa and elsewhere means that the future belongs to candidates who learn from his approach. Sanders continues to succeed among groups that wouldn’t normally be expected to embrace him, most recently being welcomed to the Vatican by the Pope and adding The Arab American News to the long list of independent groups endorsing his candidacy. His poll numbers have been neck-and-neck with Hillary Clinton since Iowa, but a strong case can be made that Sanders would be doing even better right now if he hadn’t been pushed out of the national spotlight by the incredible circus that Donald Trump has masterminded and exploited. In that circus, Trump’s dangerous high wire act has no modern parallel — and presents a spectacle that leaves much of the audience in shocked disbelief — but it can nevertheless be understood and explained through cultural precursors, as we will see below. Both candidates have succeeded thus far despite bitter opposition from within their own parties, whose leaders have bet big on supporting other politicians whom they can control more easily. For all their differences in ideology, personality and campaigning style, Trump and Sanders benefit from one key similarity whose importance has been under-explored in journalism. It’s bigger than just personal magnetism or stage presence, although those are important factors. To understand what is driving people to look past the parties and media companies that have channeled political discourse for as long as any of us can remember, we can’t simply focus on the candidates spearheading this change. We need to dig deeper, and understand what changes have occurred in the culture itself. Economic frustration is one of them. No matter how slick the messaging is, people are bound to notice sooner or later that powerful interests around the country get all the subsidies and bailouts during hard times while they get few or none. With government seeming to take care of its own no matter who is in charge, and Fox saying the Democrats are corrupt while MSNBC says the Republicans are corrupt, it’s only a matter of time before enough people start to think: Maybe they’re both right? Media companies spend as much time supporting and defending their own preferred candidates as they do attacking the others, painting confidently optimistic pictures of how things will be better if we only accept this free trade agreement, or smash that terror group once and for all. But when things don’t get better enough times in a row, the credibility of the media suffers. It’s standard practice that TV and newspapers get access to candidates and officials in exchange for positive coverage: a win-win for them with the population and democracy as the inevitable losers. This time around was once too many. People have by now keyed into the fact that that something is up. They were primed by disappointment, but tipped off by language. A phony-looking media having friendly chats with phony-looking candidates. Another Clinton. Another Bush. Clean, packaged, and everything a pose. Nobody showing embarrassment that this show has become a ritual that is divorced from the continuing struggle of real people. Nobody coming off as authentic. The boredom of Jeb “please clap” Bush versus the unctuousness of Ted Cruz. The weary inevitability of Hillary Clinton and her sprayed-on alien smile. A year ago, reporters themselves looked forward to this election season with dread. Forced to follow around candidates for over a year and a half, watching them give scripted speeches all over the country, all so they could fill month after month of 24-hour news cycle dispatches about the world’s lengthiest changing-of-the-guard ceremony. Trends in electoral politics had defied trends in popular culture for too long, and there was bound to be a correction. How could a pre-packaged, disingenuous debate between middle-aged-and-older participants about tax law, immigration policy, health care packages and free trade agreements be sustained over an 18-month period during the age of instant gratification, iPhones, internet memes, social media and reality shows? Nobody wanted to endure that marathon: Not the candidates, not the reporters, not the public. But nobody had the slightest idea how to change it either. The dam had to burst somehow. By some miracle (or catastrophe, depending on your politics), Trump and Sanders entered the race exactly when the pressure on the old system was greatest. They were the right people at the right time, with the right messages to turn a stable element into a volatile compound. Their visions for the world are entirely at odds with each other, but what Trump and Sanders have in common is that each of them speaks the language of our time. In terms of tone, rhetoric and message, both give clear and declarative statements, and speak for their constituents with unerring authority and accuracy. That they sound nothing alike is inevitable, given how deeply the country itself is divided. Neither uses focus groups to hone their message, and neither needs to. They are both naturals, born for this moment in history. Though they are well past retirement age (Trump is nearly 70, Sanders is 74), they have taken to social media as naturally as if they’d used it all their lives. And they embrace it better than most professional marketers do. There are two other complicating factors, both ushered in by the evolving structure of the internet, that have turned an unorthodox campaign atmosphere into the much more explosive spectacle that we have seen in recent days. The first is that social media allows users to easily follow only those with whom they agree. Other media formats were better at correcting for biases because they featured something resembling equal time for different candidates, as well as differing opinions and analysis. Social media, on the other hand, has a built-in option for selectively following other accounts. People tend to use it to get information from their own ideological side, as such a setup lends itself to bubbles of information where narratives are more immune than usual to outside fact-checking and counter-arguments. In this environment, certainties are cemented, social circles drift apart, and common ground erodes. The second danger point is a result of the endless competition for clicks. With ad revenue driving online media, sites across the web need to show that they can regularly draw large audiences. Headlines promising outrage are easier to write, and do far better in terms of numbers, than nuanced portraits of a given situation. Even if that indignation needs to be manufactured artificially through distortion and selective quoting, it will be. The outrage beast must be fed, because the clicks depend on it. To expect otherwise is to believe that companies will leave money sitting around, unclaimed, because of qualms about ethics. With each passing week, as people read about the awful things that their ideological opponents have done (pre-filtered by the social media circles they belong to, and amplified by the outrage industry), their anger at other candidates – as well as their ideas, their supporters, their backers – is poised to grow. With such seeds in place, separate and polarized narratives are bound to spread through society, as adamant as they are diverse. A certain degree of surprise was nevertheless warranted in this race; if the extent of the Trump / Sanders phenomenon and the social media revolution they brought to politics could have been predicted, somebody would have predicted it. Yet even as their popularity continued to grow for months at a time, the leaders of their political parties remained paralyzed with inaction. Particularly for the Republicans, the level of misplaced complacency reminded some people of the denialist, wait-and-see approach that they’ve taken with other issues as well. And that is the other cultural shift. The two political parties assumed that because economic and military power remained flowing top-to-bottom through stable channels, the power of the media would direct information in the same way. A vetted candidate makes a speech, the media reports it as news, and voter-consumers dutifully click ‘like’ and ‘share’ with what is handed to them. Not anymore. The initiative swung over to the other side when nobody was looking, and reversed the arrow of causality. The candidates rocking this election started with no electoral hype at all, no party backing, no endorsements and no mega-donors. They built a following by using social media to tweet provocatively and interact with their base. Their success with that approach became newsworthy, and their messages built an energized following which turned into sell-out crowds when they made speeches. Political repercussions came last, bringing the full force and momentum generated through the entire process. In retrospect, the success of this pathbreaking approach makes perfect sense, as a ground-up approach induces public participation and arguably evokes the spirit of true democracy better than top-down consensus. Through city after city, Trump and Sanders started taking their messages directly to the people, instantly bypassing their own party’s talking points, the establishment media and the standard, artificial, mealy-mouthed political language crafted by advisers, think-tanks and focus groups. They broke the Washington rules, spoke in street language and made it their business to shake up the country’s power structure. Everyone wanted to know: Who were these people? The most searched candidates online, by state — using Google data gathered after debates. Like Trump, Sanders put his finger on the pulse of the country. He (or his campaign) understood that the battle was no longer for the airwaves. People live online now, and see what’s happening by looking at the highlights from their Twitter and Facebook feeds on their phones. They don’t spend their time sitting at the TV to watch candidates use sit-down interviews to deliver rehearsed platitudes. That ship has sailed, and in its place is a new kind of vessel. With both of these candidates on a roll and the main parties beginning to assemble their donors, candidates and media contacts against them in earnest, Trump put his stage show in berserker mode early this year. He made himself the talk of the country by starting more pointless feuds with celebrities and boycotting a party debate on Fox. While the other candidates stood onstage and talked about their policies, Trump’s absence had more people’s attention than any words his rivals were saying. He simultaneously dominated attention on other TV channels (and of course online) by hosting a hastily-assembled patriotic fundraiser for war veterans. The question was on everybody’s lips: What would he do next? Fox, the network that normally caters to Republican voters, had never been so outsmarted, and major Republican backers realized they were losing control of the party. The Fox CEO, Roger Ailes, reportedly called Trump in an effort to make peace. This is a moment that deserves to be remembered. Masterful use of social media kept Trump’s momentum going through this period, and he backed it up by outmaneuvering his battle-ready opponents and trolling the Fox News Death Star in what would have been its moment of glory. In doing so, he didn’t just win a multi-front war. He dominated it. All of those attack pieces came from a single newspaper on a single day (March 7). Did they work? We found out the answer the next day, March 8, when the Michigan primary took place. Ranking figures in the big parties might see the performance of Trump and Sanders as an indication that we’re living in an upside-down world. But social media and online forums turned the world upside down when the old guard wasn’t looking. Trump (king of social media) and Sanders (star of Reddit and world-class tweeter) are the only ones in the game who have their orientation right. Elections are a special branch of the marketing industry, which has undergone a full-scale revolution thanks to the rise of the internet and data analytics. Historically, marketing has been a blunt instrument: A popular TV show or newspaper sells time to marketers who develop a generic message to appeal to broad demographics. That method was the standard tool of its time, which is why the political parties in the US are run by people who have built successful careers using it, and whose comfortable success has made them therefore slow to embrace change. But now, with sites like Google and Facebook very possibly knowing more about each of us than our own relatives and spouses do, marketers can use that information to carve the population up into precise categories, then target tailored messages to distinct groups of people separated by the lines they’ve drawn. General campaigning and local get-out-the-vote efforts are two different beasts, each crucial to election success. The former lays the groundwork and gets name recognition, while the latter directs people to voting locations, urges supporters to volunteer, vote and bring their friends to the polling booth. Trump and Sanders have reinvented general campaigning, but don’t have the targeted marketing experience that some of their rivals have honed to perfection over the years. They are vulnerable to losing ground on voting day because they are weak on data analytics. Here’s how it works: If one campaign office finds that their candidate’s health care policy is the most popular one for married women who live in cities, but the same candidate’s stance on guns is more appealing to men who make between $40k-$65k per year and live in the rural south, they can craft different ads for each group and target them with extraordinary accuracy at the segments of the population they’ve pinpointed. If you’ve ever Googled a hotel and then found that advertisements for that specific hotel have appeared with odd consistency while you browse the web, it’s the same kind of targeted marketing at work. The difference between an effective user of data analytics, and an amateur, can be dramatic indeed – and may play a large role in deciding the current election. Back in January, the Jeb Bush campaign, having raised a lot of money from big-money backers, decided to spend it on direct marketing. So they drew up a list of potential voters in an upcoming runoff election, and sent them packages by overnight delivery. The packages contained letters as well as iPad-like video players and power cords. The players were pre-loaded with a 15-minute documentary about Jeb Bush’s life. A much more interesting case study came about when Donald Trump and Ted Cruz faced off in February at the Iowa Caucus. Trump entered the week with a lead in poll numbers, but Cruz had the better on-the-ground strategy for winning voters, and the right team to implement it. An article in the Guardian entitled “Ted Cruz erased Trump’s Iowa lead by spending millions on voter targeting: Filings reveal Texas senator paid $3m to profiling company … in ‘military escalation’ of data-powered campaign” explains how the Cruz team came away with the victory by doing the market research and putting the right message in front of the right people at the right time. The New York Times agrees: The clear takeaway from the oft-overlooked Iowa voter story is that targeted marketing is a force to be reckoned with. Poll numbers notwithstanding, Trump’s chances in the general election may hinge on whether his campaign team learns the right lessons over the next few months, and becomes adept at modern marketing. Trump himself has certainly figured out the basics and has begun to pivot accordingly, as we will see in Part 4 below. But everything starts with popularity. Use analytics and targeted marketing all you like, though as Marco Rubio has learned, nobody will turn up for you on voting day if they just don’t like you. So how specifically are Trump and Sanders doing it? Do they know something their rivals don’t? The disappointing Bush and Cruz campaigns learned belatedly that their poor performance on social media was the reason why Trump had all the buzz and they didn’t. Like an out-of-touch dad trying to bond with a teenager, Cruz went after Trump by tweeting a nonsensical Austin Powers video in an effort to be hip. Losing the public’s attention to tough-talking Trump, Cruz and Bush tried to prove their own masculinity: Cruz by eating bacon cooked by the heat of a machine gun, and Bush by sending this inexplicable tweet of a gun with the safety off and his own name on it, and calling out “America” (as a threat? nobody even knows) in the text. Even if there had been any point to this posturing, it was always going to backfire because, personality-wise, both Cruz and Bush are weaklings playing Trump’s game. Trump can sell himself as a tough guy; Cruz and Bush can’t. Tweeting that you’re tough doesn’t make it so. It only makes you a poseur. Social media has developed its own language that can’t be faked anyway. As an example, think again of teenagers. They have their own culture, their own soundtrack, their own slang and mannerisms, their own worldview – and if an adult tries to join their group and act like he’s one of them, he’s more likely to earn their scorn than their approval. The coup de grace of this failed strategy came on the same day of the Jeb Bush ‘America’ tweet, when the world discovered that going to JebBush.com automatically redirected browsers to Trump’s website. That prank has run its course (it now leads to an empty page), but TedCruzForAmerica.com still opens up an anti-Cruz page that tells users how to immigrate to Canada. 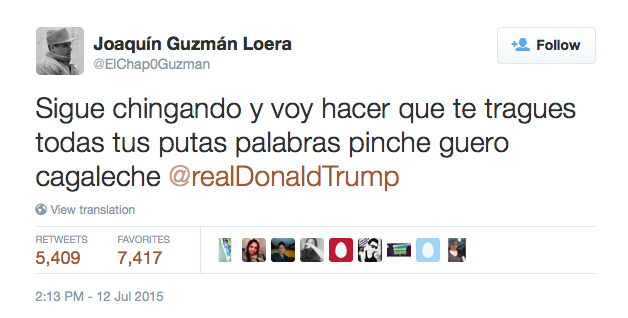 Trump’s rivals can try all they want, but these are the insults that go viral. Trump has been so successful because this is a New Media Moment. You know, FDR understood radio. He dominated. JFK understood television. Dominated. Obama understood the internet. Dominated. [Trump] understands social media and reality television, and he’s dominating. And everybody else is playing by the old rules …. We thought he was going to leave the entertainment world and come over the wall into politics. He has pulled politics over into the world of entertainment. We’re now living in his reality TV show. Marco Rubio’s campaign damaged itself beyond repair because of his incomplete understanding of social media. He wanted to get a positive viral clip of himself online so badly that he tried his same rehearsed speech 4 times during the course of one debate, not realizing that the internet wouldn’t pick out his best take to go viral: It would splice together of his attempts and turn him into a Marcobot that delivers canned talking points like a puppet when you pull the string. Trump and his campaign have authored so many ugly moments that would have backfired in a similar way if he hadn’t ridden the wave of attention to embrace the controversy they generate. But controversy brings attention, and whether you love or hate him, he’s the one everyone is talking about. And when they pay attention to him, he earns a massive audience for his uniquely compelling skills as an orator. There is a market on social media for trolling, but also a market for the issues. Bernie Sanders dominates the Democratic side’s conversation on Twitter, and has taken on Clinton directly with considerable success. This is the kind of clear talk that young people can get behind: The right stands on the right issues, bold and unqualified. Sanders’ charisma, relatability, stage presence and viral, sound-bite-friendly language has earned him just the kind of enthusiasm and devoted following he needed to make a serious bid for the nomination as the primary season rolls on. … but as was easily predicted, there was no way that Sanders supporters would let an opportunity like this pass them by. Sarcasm is not Bernie Sanders’ style, and doesn’t fit with the tone and image he embodies. But even though he didn’t take the easy win, his supporters did. As with Trump’s opponents on the Republican side, the Clinton team has taken beating after beating in the online world — the very place where their audiences now live and breathe — because of their mistaken confidence that they can use their old media compass to navigate a new media landscape. Social media’s potential for either massive success or a huge PR meltdown isn’t confined to America. Just a few weeks ago, Malaysia’s famously corrupt Prime Minister thought it would be a good idea to start the hashtag #RespectMyPM. You won’t believe what happened next! The broadest lessons from this election cycle are timeless. Wise marketing organizations have long known about the importance of researching their audience, appealing to their instincts, talking straight with them and tapping into the spirit of the age. The difference now is that the audience has changed. Their instincts have changed. The messages that resonate have changed. And technology has made finding the spirit of the age a tremendous challenge for organizations of any size, because it allows the culture itself to change too quickly for most institutions to catch up with it. Here, as elsewhere, Trump is an exception. Rhetoric aside, politicians have a special challenge when navigating society’s changing tastes with regard to the issues themselves. In the 1990s, Hillary Clinton echoed her husband’s tough-on-crime message, and now some of her old stances are coming back to haunt her due to cultural shifts in the age of partial drug legalization and the Black Lives Matter movement. Bernie Sanders’ consistency over the decades of his career has led to much of the country just now catching up with many of his progressive ideas on economic equality, social tolerance and antiwar foreign policy. To Sanders’ credit, he has chosen the ideal time to run for president; any earlier, and he would have had a hard time selling his worldview to middle America. Donald Trump presents the most interesting test of how much – and how often – a candidate can reinvent himself. Trump’s previous endorsements of liberals (including Hillary Clinton) and liberal issues are well-publicized, and he seems to have successfully defended himself from charges of flip-flopping by saying, “I evolved!”. But on March 1 of this year, he delivered a stunning and devastating speech – even by his standards – that must have chilled the offices of the Clinton campaign. Trump’s ‘Super Tuesday’ victory speech was preceded by months and months of increasingly outlandish statements, any of which would have surely buried a candidate running for office in a conventional campaign (which this wasn’t). From giving away rival Lindsey Graham’s personal telephone number (resulting in this), to mocking John McCain’s war history (“He was a war hero because he was captured. I like people that weren’t captured”), to starting a ridiculous name-calling war with Fox anchor Megyn Kelly, to re-tweeting white supremacists, boycotting a debate, insulting or threatening to deport enormous groups of people (usually Mexicans or Muslims) as well as making a personal enemy of a drug lord, Trump has been a one-man news cycle in a way that the world hasn’t seen in the 20 years since the OJ Simpson trial. But in this speech, we saw a very different, almost unrecognizable Trump. (After he was done calling Marco Rubio a ‘lightweight’, of course.) He was … mature. Almost graceful. He was making genuinely good points. He was turning his attention to Hillary Clinton, and hitting her weakest spots, again and again, patiently and persistently. This has been an amazing evening. Already, we’ve won five major states and it looks like we could win six or seven or eight or nine. It’s really been — it’s really been great. I want to [congratulate] Ted on the winning of Texas. He worked hard on — I know how hard he worked actually, and so I congratulate Ted Cruz on that win. That was an excellent win. We’re going to make America great again, folks. We’re going to make it great again. And you know, I have thousands of employees all over the country, actually, all over the world but for purposes of tonight, we’ll just say all over the country. And it’s been just so beautiful to watch this company grow and to watch it grow so strongly. I think one of the reasons I have such great support, is that people, you take a look, people in the middle-income groups are making less money today — less money than they made 12 years ago. And in her speech, she just said they’re making less money. Well, she’s been there with Obama for a long period of time. Why hasn’t she done anything about it? Practically everything that she was complaining about — she’s picked up what I say. The difference is she’s been there for a long period of time. Why haven’t they done anything about it? Had he believed all he’d said in the earlier part of his campaign? Did he believe what he was saying here? Was he “evolving” again, or – as a top aide has suggested – was this all an act? If you take off his mask, is there anything under it, or just another mask? What is he doing this for? Does he actually have a plan to try to help the country, or is he just here for the attention? Is it true that his financial independence means that he can put the country first, instead of serving lobbyists and donors – or is America about to elect an actual internet troll to the office of the president? Trump showed his softer side again after his recent win in New York. As a marketer, I cheer for him: He is pushing the limits of the craft, and pulling off a world-class achievement, singlehandedly, on the biggest of stages. In American terms, he is the Steph Curry of candidates; he takes shots that any sane person would tell him not to take – and he somehow makes them, again and again and again. As a citizen, however, I worry. Politics actually is important, and there is a real danger in having the presidency come down to who can be trendiest and write a great tweet. As long as there is psychology, people will be susceptible to some degree of manipulation, but whoever the US votes for in this election, let’s at least hope it’s a president who will keep the country well-educated – so that people can retain some measure of control of their own ideas, and follow the agendas of brands and marketing agencies only when they consciously choose to. As for the establishment: With the usual power centers in government, business and media losing ground daily to Donald Trump and Bernie Sanders, the near future may belong to those who are fastest to understand the phenomenon from which those candidates are drawing their influence. Some already do, and are using that understanding to create an effective counter-narrative. Comedian John Oliver’s puncturing of the Trump brand was very effective, as was the fake Trump ad put together by Saturday Night Live. But these spectacles were sobering at the same time. They showed us that Trump can be beaten at his own game, while also reminding us that this is indeed the game and this is the playing field on which we are now doomed to compete. Whoever wins this November, the lesson from this campaign is that the ‘old way’ of talking at people simply will not do anymore. Two-way communication, precision messaging, strong competence in all areas of social media – these are the markers of the future of ideas. Embrace them, and you can ride the next wave. Ignore them, like the current establishment has done, and that wave will come crashing into you. About the author: Steve Callerame is Senior Content Writer of Lexicon Business Communications: a digital marketing and copywriting agency in Bangkok, which specializes in branding, multimedia design and social media marketing.